“All some people know is how to enjoy it, but they aren’t knowledgeable about the process of how it become the king of fruits, and that is what this first agri-heritage tour will provide to the people,” said Roderick St Clair, Business Development Officer at the Marketing and National Importing Board, in describing the objective of the tour which held as part of pre-activities leading up to 2015 mango fest. Mango fest will be held at the National Stadium on 31 July, and in an effort to expose more persons to the health and other benefits of the fruit, the MNIB held a series of activities last Monday at its outlet. The newest addition to the festival pre-activities is the Agri-Heritage tour, which according to St Clair, will start in St George’s and take people around the island, stopping at various points where they will be educated about mango production and at the same time about the island’s cultural heritage. “Among the places we will stop at this guided tour is at the CARDI centre, where they learn lots of information about mango production. There will also be farm visit, a visit to River Antoine for a cultural display, as well as a visit to the slave pen,” he said. “At the end, the people who attend will learn about Grenada’s agriculture, Grenada’s heritage and most importantly, the linkage between agriculture and who we are as a people,” he explained. Persons interested in the tour should contact the MNIB. 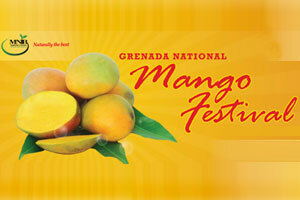 Sales Manager, Najuma Francis, said that on the day of the festival there will be the normal booths and stalls with everything reflective of mango, while in the lead the MNIB outlets will be engaging patrons in educational sessions where they will learn about various ways in which mango can contribute to the kitchen. “We will be having sampling of cuisine at the outlets, as well as display and sampling of mango products and providing of nutritional information and facts,” she said.